JetGuten is a top-notch addon for Gutenberg editor, which provides the set of content blocks with intuitive visual stylization. 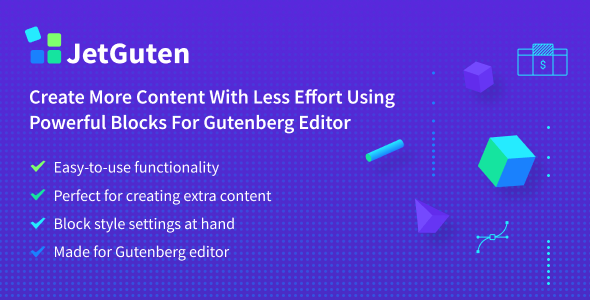 Enjoy working with Gutenberg editor while using the multiple content blocks that allow adding stylish Circle Progress elements, Progress Bars, SVG images, Image Comparison blocks and banners. JetGuten plugin is created specially for working with Gutenberg editor. The widgets provided in it are easy-to-use and can be smoothly customized from visual editor interface. JetGuten provides the set of content blocks available for adding and editing. Everything is simple and clear. JetGuten will add the new content blocks into Gutenberg, providing you with more opportunities of creating content. This block makes it possible to add animated boxes to the pages built with Gutenberg. The block possesses easily changeable animation effects, and the whole set of appearance settings for the back and front sides of the box. This block will assist you in creating banners from your custom images with the most stylish animation effects, to attract attention of the visitors to your links. The widget has 11 effect settings along with the title, description and overlay styles that can be easily changed according to one’s needs. The block is useful for showcasing the current progress of the project, or displaying the rate in percents or to show the proportion from the maximum value. The block provides you with the easy-to-use content settings as well as stylization settings for the circle, value and label blocks. This block allows to display the countdown to the set date in the future using the simple countdown that displays the days, hours, minutes and seconds. The block has easily manageable settings, allowing to change the size of the timer, display the separator, change value, label and panel settings. This block provides you with an ability to add the two-image block to showcase Before and After state of the object you’re displaying. It has the basic content settings as well as the style settings for the labels, border, etc. This block provides you with an opportunity to add SVG images without the need to add any extra plugins to WordPress. The block makes it easy to download and display the image that has scalable vector graphics format. The block is a perfect solution if you’re looking for an easy way to add a Google map to the page built with Gutenberg. The block provides access to the general settings, such as Address, Map or Satellite view, zoom level, etc. This block will help you display the pricing blocks with all the necessary content added to them using one of the preset styles. You’ll also be able to customize the appearance settings for the pricing blocks, making them suit your general page’s style. This block allows adding attractive progress bars to showcase the progress of the process you’re displaying. With this block you’ll be able to change the progress value, change the layout style by selecting one of the 6 styles, and customize the style of the bar. JetGuten has vast documentation that will help you use the set of blocks in JetGuten. Competent support team will promptly handle all your questions and will be happy to help you with JetGuten.